Edward Burtynsky is internationally acclaimed for his large-scale photographs of nature transformed by industry. 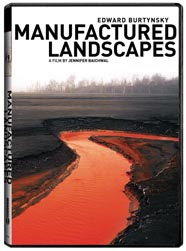 Manufactured Landscapes – a stunning documentary by award winning director Jennifer Baichwal – follows Burtynsky to China, as he captures the effects of the country’s massive industrial revolution. This remarkable film leads us to meditate on human endeavour and its impact on the planet. "The upright, two legged naked ape that appeared in Africa 150,000 years ago has become an immense force. Our species is now altering the physical, chemical and biological features of the planet on a geological scale. This film let's us look at the impressive, yet troubling scale of our impact. Everyone should see it!" "A protracted exploration of the aesthetic, social and spiritual dimensions of industrialization and globalization... Raises some sigificant and sobering questions about the impact that we, as humans, make on our environment"
"Manufactured Landscapes tracks the beauty and the horror of industry's imprint on the earth"